Doha Bank was honoured with “Golden Peacock Global Award for Excellence in Corporate Governance” for the year 2018 at Institute Of Directors (IOD) India’s, “18th Annual LONDON GLOBAL CONVENTION on CORPORATE GOVERNANCE & SUSTAINABILITY” and Golden Peacock Awards Presentation Ceremony at Hotel Montcalm, Marble Arch, London (UK). 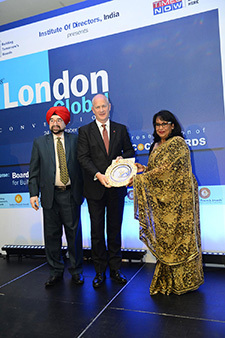 The Award was presented by The Baroness Verma, Global Chairperson, Advisory Council, Institute Of Directors, India and Chairperson, European External Affairs Committee and former Minister of Energy, Climate Change and International Development, Government of UK. “This award is a recognition for Doha Bank Board for its active involvement in promoting excellence in Corporate Governance,” said Dr. Seetharaman, CEO of Doha Bank.